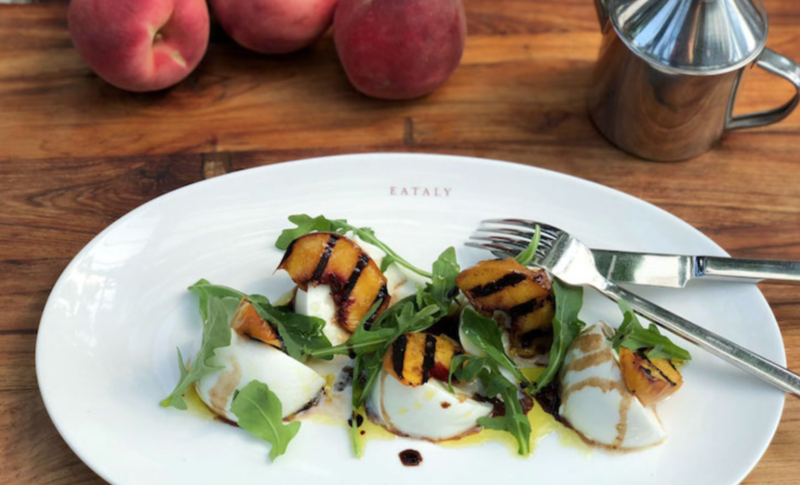 A creative twist on the classic caprese, this salad with grilled peaches, arugula, and mozzarella is the perfect way to celebrate summer's bounty. Preheat a grill pan or cast iron pan over high heat. Toss the peach slices with a drizzle of extra virgin olive oil and place them on the grill pan, cut side down, just long enough to get some grill marks on the cut side. Cut the pieces of mozzarella in half and place one half on each plate. Divide the peach wedges among the 6 plates and arrange them on the plates with the mozzarella. Toss the arugula with the extra virgin olive oil, balsamic vinegar, and salt, to taste, and add it to plate along with peaches and mozzarella. Season with Maldon salt, to taste and serve immediately.